I have managed to complete a few rows of the blanket despite the heat, and when I took the photo I was surprised at just how large the blanket has got. I’ve also managed to overcome the hurdle of casting on the second sock. Because it is now officially ‘on the needles’ I’m hopeful that second sock syndrome won’t sink in! I’m about halfway through the ribbing on the cuff now. I’m planning to take it to a football tournament on Saturday, but whether I will work on it there is a different matter entirely! In celebration of the light evenings I decided to take all of my photos on the lawn, I thought it made a nice change of background! I hope you’ve still managed to craft in the heat, I’m trying to make the most of the nice weather whilst not getting burned. It’s a challenge when you have fair skin. What are you working on this week? Feel free to share here or tag me on Instagram. lovely things ) Good luck with that second sock syndrome.. Enjoy the warm weather. Curious what is the temp during the day? Thanks for the congrats lol. It’s only up to 30 here maximum but that us hotter than we are used to. Thank you! I hope the heat isn’t too bad, we are getting used to it now but it does mean a lot of plant watering is needed! I’m hoping it’s not getting hotter, we have a football tournament on Saturday and spending 5 hours in the sun is not my idea of fun! Loving the blanket colours. I’m catching up on sewing all my daughter’s new badges to her camp blanket ready for her summer Guide camp. Sewing badges on is one of my least favourite jobs lol. Hope she has a lovely time. Your Blanket is Beautiful Mrs. C. Yay on the second sock! You got this! Try and find some shade during the tournament. Thanks, we managed to find a shady spot but I didn’t do any knitting. I wish we had rain! Kudos to you for working on a blanket while it’s hot 😍 It is gorgeous so I can see how it’s hard to stay away! Thanks! It’s not too bad in the evenings. 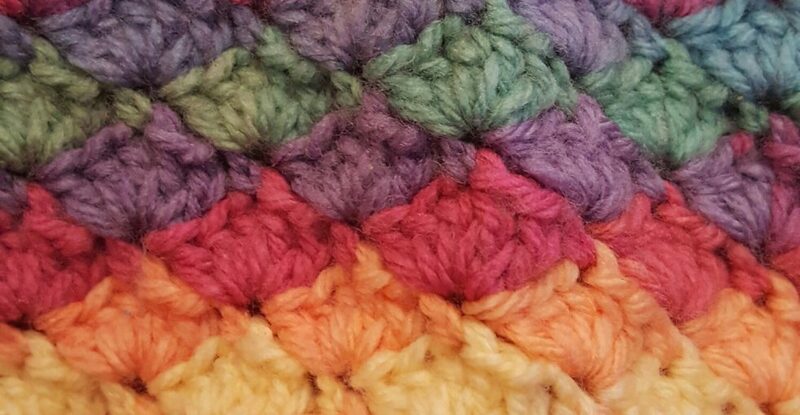 Granny squares sound a good idea too! My blanket has been well and truly set aside recently, it’s just too hot for cheap acrylic! I’m still beavering away at my Tunisian top though; cotton isn’t so bad to work with and I’m soooo close to the finish line. Fab! I bet cotton is quite nice and cool to work with.